Theresa May’s draft Brexit Withdrawal Agreement (WA) may be better than nothing but it isn’t the best possible deal for the UK, for British business, nor for British citizens. But a better deal may still be in the cards for the United Kingdom and the European Union. That’s the difference between Theresa May’s risky deal and a great deal for both sides. With better negotiators the UK government would’ve succeeded on all counts, including the three mentioned above. That goes without saying. If Theresa May had brought that deal home it would’ve been signed, sealed and delivered by now. However, if Parliament rejects the present draft WA as it seems destined to do on December 11, 2018 — there’s another kick at the can which could happen on any given day right up until March 29th, 2018. And that’s exactly what needs to happen. In the very few days after the present draft Withdrawal Agreement fails in the UK House of Commons, British MP’s should vote on and approve such changes to the draft as necessary and send Theresa May or her Brexit secretary back to the EU with the new offer that’s approved by Parliament. The moment the EU signs on the dotted line it’s binding on all concerned parties. That’s how to get this deal done. Offer, then counter-offer. Repeat, until both sides are satisfied. That’s how negotiations work. Comprendi? What’s the Deal With the Backstop? The whole Northern Ireland border issue is a red herring. First off, the situation between the people of Northern Ireland and the people of the Republic of Ireland has matured over many years to the point where a normal border (like every country in the world employs) could be created and there wouldn’t be a problem operating a normal, hard border. Alternatively, if the situation between the two jurisdictions isn’t as mature as I suggest, technology could be employed to capture tariffs and ensure standards are met at the point of delivery in both jurisdictions. And if the UK decides to utilize a zero-tariff economy post-Brexit, there’s no need for remote or in-transit tariff technology as there won’t be any need to capture tariffs. With a little bit of creative thinking the wholly contrived ‘backstop issue’ goes away and most of the problems with Theresa May’s draft Withdrawal Agreement disappear! Once the backstop disappears there’s no longer any need for the ECJ to have jurisdiction anywhere in the UK. Even if that means that Republic of Ireland exports destined for Northern Ireland must first be shipped to England, Scotland or Wales (to allow proper border checks to occur in England, Scotland or Wales) and then on to Northern Ireland in the normal manner. The reverse is true for exports from Northern Ireland travelling to the Republic of Ireland. To satisfy all UK and EU regulations goods could be shipped from NI to England, Scotland or Wales ports, and after passing inspection, shipped on to the RoI. Such trans-shipment procedures are quite normal in the 21st-century, but it might be a first for Europe. Can they handle it? Only a fool accepts the first offer in any negotiation process — and that is doubly true when dealing with politicians who spend their entire careers negotiating one thing or another. The problem is that Brexit negotiations are taking too long. The longer it takes to agree a Brexit deal, the more uncertainty for markets on both sides of the English Channel. Only in Europe could Brexit take 3-years (we’re almost at 3-years now) and at present rates of progress it looks like it could drag on for another 3-years. When Britons stop acting like they live in the 120th-largest economic power in the world instead of the 6th-largest the UK will finally live up to its full potential. However, it has significant deficiencies that need to be rectified before it can be approved by the House of Commons. Once those corrections are made it should be passed immediately by UK MP’s and sent on to the EU27 for their approval. Theresa May should offer her draft Withdrawal Agreement up for vote in Parliament on December 11th as planned. Where it is likely to fail. The PM should then offer the Political Declaration (only) up for vote on December 12th to demonstrate goodwill to the EU. Where it should pass easily. Then the Prime Minister should consult with party leaders in the House of Commons and along with her Cabinet, create a counter-offer consisting of the existing draft WA, but with the backstop removed, any reference to the ECJ removed, and a firm end-date for leaving the so-called ‘temporary’ Customs Union with the EU. That date might be December 31, 2020, or it may be December 31, 2021. And that new Withdrawal Agreement should be voted on and passed by the House of Commons if MP’s wish to honour the will of UK voters. If the EU ratifies those changes, they get £39 billion on March 29, 2019 that Theresa May promised them in exchange for a signed Withdrawal Agreement — but if they don’t ratify it the UK owes (only) £9.65 billion (according to reliable sources) to the EU to pay expected future obligations to the EU. On top of everything, everyone should stop panicking. 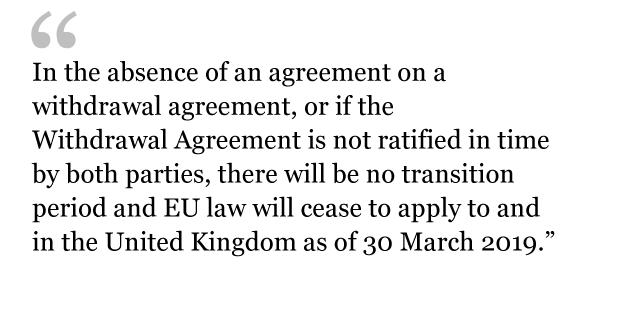 We’re talking about a DRAFT Withdrawal Agreement, which by definition, means it’s still subject to negotiation no matter what EU negotiators or Theresa May say. It’s a DRAFT proposal. Get it? It’s time for British MP’s to grab hold of this process; Let the deal fail in the House of Commons, then get the Political Declaration passed in the House, and then make the alterations to the draft Withdrawal Agreement that a majority of MP’s can support, then get that officially passed in the House — and then offer it to the EU by December 31, 2018. In that order. And that soon. If the EU accepts the new Withdrawal Agreement proposal, everyone’s Brexit problems are solved, which allows the EU to be eligible to receive £39 billion on March 29, 2019. If not, there’s plenty more time for negotiations no. matter. what. the. politicians. say. By Letter to Britain in Brexit, European Union, UK on December 6, 2018 .